Etihad Airways is expanding its Saudi Arabian network through a new five-times-per-week service between Riyadh and Abu Dhabi operated by its codeshare partner flynas. Commencing on 16 December 2015, the new flynas service will complement Etihad Airways’ existing 13 weekly flights between Abu Dhabi and Riyadh, to provide guests with 18 weekly flights and greater choice and flexibility whether travelling from Saudi Arabia, the UAE or beyond. 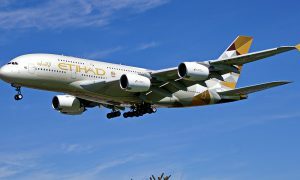 The flights will be operated by a two-class Airbus A320 aircraft, offering an additional 1,640 seats per week, and ensuring maximum connectivity through Etihad Airways’ Abu Dhabi hub to key destinations in North America and the Indian Subcontinent. This comes as part of an expanded codeshare agreement between the two airlines, which was initially signed in October 2012. The current codeshare scope allows flynas to place its ‘XY’ code on 226 Etihad Airways’ flights between Abu Dhabi and 20 destinations around the world. 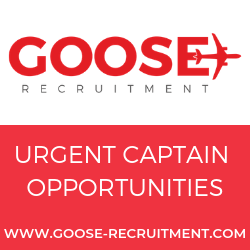 These include Amsterdam, Brussels, Casablanca, Dammam, Geneva, Islamabad, Jakarta, Jeddah, Karachi, Kuala Lumpur, Lahore, London, Manchester, Medina, Paris, Riyadh, São Paulo, Seychelles, Singapore, Zurich, and subsequently on flights operating to the Indian Subcontinent over the coming months, subject to regulatory approvals. 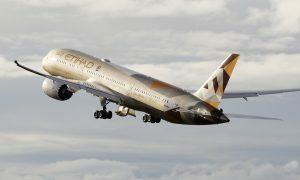 Etihad Airways has 49 codeshare agreements in place with airlines across the world, including flynas, which gives it a combined passenger and cargo network of 600 destinations, and over 25,200 flights per week, more than any other Middle Eastern airline. 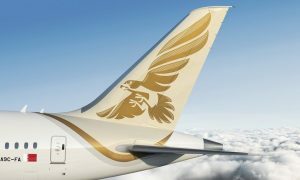 Codeshare partnerships, along with minority equity investments and organic growth, form the three pillars of Etihad Airways expansion plans. Etihad Airways launched services between Abu Dhabi and Riyadh in December 2004. The airline offers 46 flights per week between the UAE’s capital and the Saudi Arabian cities of Jeddah, Damman, Riyadh and Medina. Services are often increased to 55 flights per week on temporary operating permits.